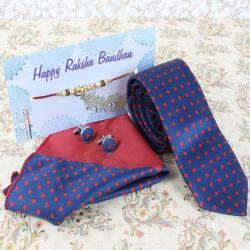 Product Consists: Micro Jacquard of Red Maroon Weaved Printed Tie and Cufflinks Set along with Rakhi Thread. This combo brings joy and happiness in your relationship with your dear brother for sure. 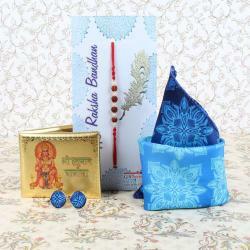 Choose this Rakhi pack and give surprise that he will never forget. This stylish Rakhi with Cufflink gift set of Giftacrossindia.com will make this occasion really special for your loving brother. Raksha Bandhan is a wonderful time to let your brother know how much you care and love him as this combo contains classy selective items for festive gifting purpose. 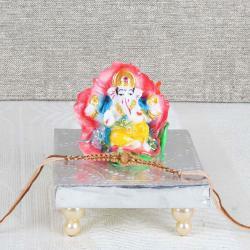 Shop Rakhi with Cufflink set as it is an excellent Rakhi Gift choice option for your all dear ones. 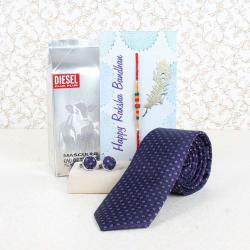 Product Includes: Micro Jacquard of Red Maroon Weaved Printed Tie and Cufflinks Set along with Rakhi Thread.